This entry was posted on April 1, 2019 by piranha. In the UK, an estimated 2 million people are living with a food allergy. This includes the more well-known allergies to nuts, shell fish, bananas, soy and eggs, as well as some of the more unusual such as marshmallows and hot dogs. For people with allergies, the effects of eating trigger foods can range from mild to extreme discomfort, anaphylactic shock and even death. In 2014, a new law was introduced to make it easier for people with allergies to eat out more safely, and to alleviate what can potentially be quite a distressing experience. However, last year, the media was filled with news of the tragic death of a girl who suffered a fatal reaction to sesame in a Pret a Manger baguette. This has led to claims that the legislation on clear labelling and transparency of food ingredients has not gone far enough. Effective catering for people with food allergies and intolerances, making them feel safe, informed and cared for, is clearly not just a moral thing to do, but can also be a good avenue to help your food business stand out from the rest, and to help to boost your business. Make sure that your menu caters for people who need to eat gluten, lactose, wheat, and dairy free, that your staff are fully aware of all the ingredients in your food, that they can clearly communicate this to customers, and that all of your ingredients are obviously stated. This also means that you should have the same level of knowledge of all the products that you buy from suppliers and that you only use those that are reliable. Review your menu… you may find that there are a number of dishes that already meet special dietary requirements. If there aren’t get creative and make sure that you are catering for everyone and filling the gaps in the market. Why not promote your front of house staff as dietary champions who are able to proactively promote allergies, food intolerances, wellbeing, nutritional labelling, and a great customer experience for everyone. Make sure your staff are well trained and up to date with any menu and ingredient changes. Never guess, and always be completely honest. Another focus should be on avoiding cross contamination. This is particularly important in food preparation, when cleaning down tables, and when cooking. When barbecuing, make particularly sure that everyone stays safe and well. Why not buy dairy free cheese and gluten-free buns? 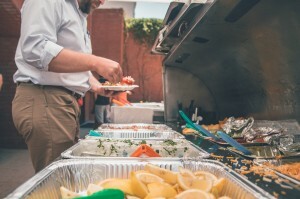 One big issue at a barbecue is often the cross-contamination from the grill for those with food allergies. Prior residue can remain on the grill from a previous day or the new marinades can drip and stick to the grill as well. To ensure food allergy safety, be sure to clean the grill for allergen-free foods first before putting anything else on the grill. Using tin foil can prevent foods from having to be cooked directly on the grill where there is reason for concern about food allergies. Become an advocate of allergy and food intolerance sufferers. Why not shout it from the rafters to help them and your business?